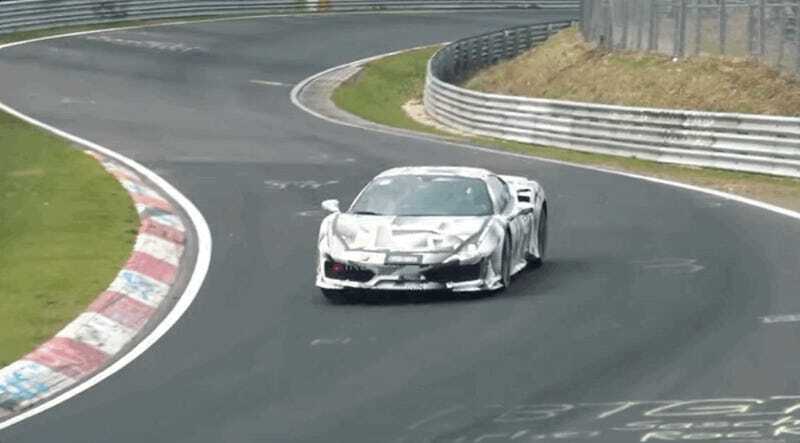 Ferrari is making the final tweaks on its new 488 Pista, meaning that test mules are out and about, like this one filmed recently at Germany’s Nürburgring. It sounds good, for a twin-turbo V8, and also, yes, seems quick and grippy, like its 488 predecessors. The 3.9-liter engine will make a claimed 711 horsepower and 568 lb-ft of torque, all pushing a car that has dropped some weight from other 488s, coming in at 2,821 pounds. And at Nürburgring, the car is truly in its element, as Pista means “track” in Italian. A car this powerful belongs nowhere else. Back in February we saw some official press photos of the Pista for the first time. They still look good!